I try a lot of random products and never have any expectations. This product had some pretty good reviews so I decided to pick it up as a wild card at Target. I'm fairly happy with the purchase. I use a body scrub 2-3 times a week in the shower on the days I plan to use self tanner. It's really important to me that a scrub doesn't have mineral oil as its first ingredient because it leaves a film on my skin that doesn't allow my tanner to absorb properly. This one does contain almond oil and sugar but I don't notice residue after I rinse it. I love the smell, very lemony and sweet. The texture is a little more course and grainy then I would normally like and I almost have to apply it twice on my legs because it is so thin. That being said I'm happy with the results, I definitely feel softer after I use it; especially my knees and elbows. For an 15.2 oz jar I paid $16.99 but I will probably not repurchase. 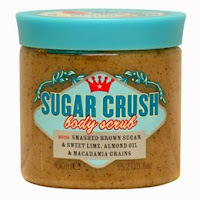 After this jar I will continue my hunt for another sugar scrub.